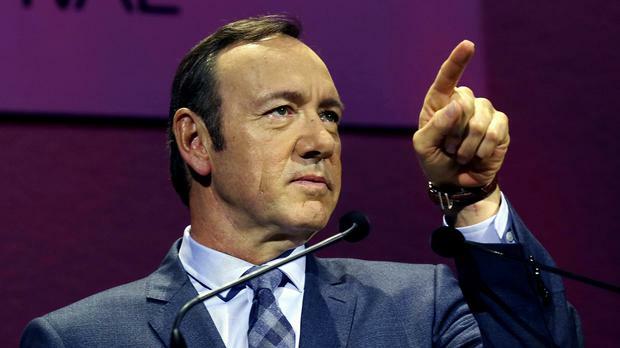 Oscar-winning actor Kevin Spacey reprimanded a member of the audience guilty of leaving their mobile phone on during the opening night of his one-man show. The House Of Cards actor stars in legal drama Clarence Darrow to celebrate the end of his 10 years as artistic director of The Old Vic theatre in London. The play sees Darrow, pioneering lawyer of 19th century America, relive some of the experiences which established his reputation as a courtroom giant and civil rights hero. During a scene in which his character is on trial, defending himself, Spacey was addressing the audience with a passionate plea for his innocence, when a mobile phone began ringing in that section. The music got louder and louder as the guilty party tried to look innocent, until Spacey finally snapped, in character: "If you don't answer that, I will!" He received a round of applause. Performing in the round, Spacey had the audience hanging on his every word as he moved between engaging chats and witty anecdotes, to emotional confessions and rousing speeches. The 54-year-old star's commanding performance earned him a standing ovation. Spacey has played the character before, on stage in Inherit The Wind and 22 years ago in the PBS film Darrow. He said: "Clarence Darrow was a unique and courageous man. Several of my favourite actors have played Darrow... Henry Fonda, Orson Welles and Spencer Tracy. "Finally, throw in that I've never done a one-man play, or performed in the round before, and this production offered me two firsts. Plus, you know I love a challenge." The production is directed by Thea Sharrock, who made the Christmas special of Call The Midwife. Spacey, who has appeared in several Old Vic productions during his decade's tenure, including Richard III and The Philadelphia Story, is stepping down as artistic director next year. He will be replaced by Matthew Warchus.